I usually prefer my machines with an engine and four wheels, but sometimes something a little different strikes my fancy. Earlier this year, I told myself that I should start riding my bike more often. And why not!? I live only a mile from my local grocery store, and just as close to numerous shops and restaurants. One day, driving to all of these places in my car just seemed…silly. But, like most suburban Americans, I had never really used a bicycle as a form of transportation, mostly as a ‘toy’ when I was a kid. Getting a little discouraged, I was planning on settling for a ‘hybrid’ bike – a sort of Frankenstein machine with a mountain bike-like frame, 700c road wheels, suspension fork, flat handlebars…and disc brakes. Then I discovered Cyclocross bikes. These bikes are more like overbuilt road bikes ( with drop bars) that can handle the punishing, insane demands of CX racing, but fit a variety of tire sizes as well as mounts for racks & fenders. 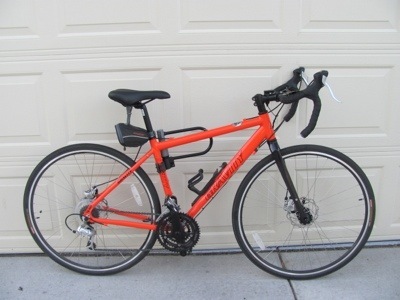 Basically, the perfect bike for what I was looking for…and lots of them had discs! However, most of the CX options with disc brakes available from the big manufacturers were beyond what I wanted to spend ($1200+)….so I turned to the internets(!) and discovered bikesdirect.com. If you’re not familiar with bikes direct, they’re a purely online retailer that sells ‘off brand’ frames with nice, name brand components for WAY less than a comparable bike at a local shop. And, the general opinion on their ‘off brand’ frames are that they’re welded along side the higher end name brands in the same factory in taiwan (where most frames are built), and some of them are identical, save for some paint and decals. Now, I’m 100% for supporting your local business, but I also can’t ignore the fact that their bikes are a great value, add in free shipping to your doorstep, and it was a no brainer. I eventually settled on their Gravity Liberty CXD and was out the door for $500. 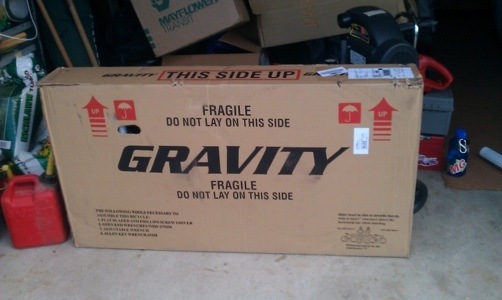 It arrived in a huge box that may as well had ‘some assembly required’ written across it – that’s the catch with bikesdirect (that and no after sales support like you would get with your local bike shop). But seriously, it came about 90% ready. I had to put the front wheel and handlebars on, I had to air up the tires, put the pedals on, and adjust some things (brakes, seat, shifters, derailers). But bikes are easy, I mean, if you can handle wrenching on your go kart, you can handle a bicycle. I was up and riding within 30 minutes. I really like my cheap bike, but more importantly, I really love cycling. Running errands is surprisingly quick and hassle free, especially with a rear cargo rack and backpack. Since this bike is so well rounded, I can run errands with it during the week, commute to work on it, and take off some unnecessary bits for a long ride on the weekend. It’s almost like fitness disguised as fun, because riding a bike can be a hell of a cardio workout, and it’s much more fun than staring at the back of a Kia on your morning commute. So, I guess I really just like things with wheels and gears. Engines are fun too, of course, but there’s something to be said about using yourself as the engine. 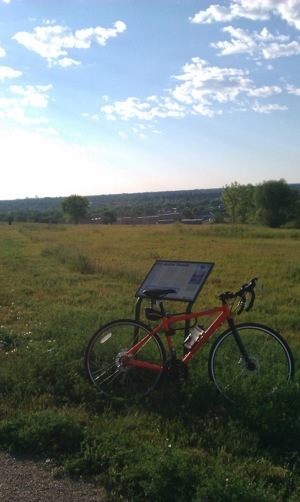 Plus the scenery is much better too, this is on my ride to work! How are you liking the CXD? Any comments on the ride, components, ect? So far so good! Nearly 1000 miles on it so far and it’s been a good ride. I’ve tweaked the stock seat, stem and handlebar positions to fit my liking and its pretty comfy. The fatter tires and CX geometry work out pretty well for the rough&tumble of suburbia, and I love the cross brake levers. The components are ‘low end’ in the cycling world, but its fine for my first road bike and a commuter. However, I think I may have a rear brake caliper going out, as sometimes ill lose braking power if I apply enough force. Not a big deal though, the calipers are easy enough to swap, and only around $35 on eBay. Been commuting 14-20+ miles (round trip) 2-3x a week with a rack and panniers, plus weekend rides and trips to the store. Just put clipless pedals on it too! Overall it’s a pretty solid buy for the money! Just curious what size you got and how tall you are. I bought the 46cm version. I’m about 5’7″ (1.7m) tall with about a 30″ inseam (76cm). I’ve never been professionally fitted (but I’ve read up a lot on it), but I think it fits me well after some saddle/bar/stem adjustments. In hindsight I probably could have bought the 50cm model, but I figured It would be easier to ‘size up’ a small frame than scale down a larger one. Biggest comfort issue for me so far is the saddle, it’s a bit too squishy for my tastes.